Once again, I am late posting my harvests for last week. And I didn’t take many photos either. But I sure had some good harvests. Our Florida Prince peach has decided to ripen all of its fruit at once. This is one container of three that I picked. I made a peach pie this week, but we ate it all before I could photograph it. We harvested oranges, lemons and limes this week, plus lettuce and artichokes, but this is all that made it in front of the camera for a portrait. 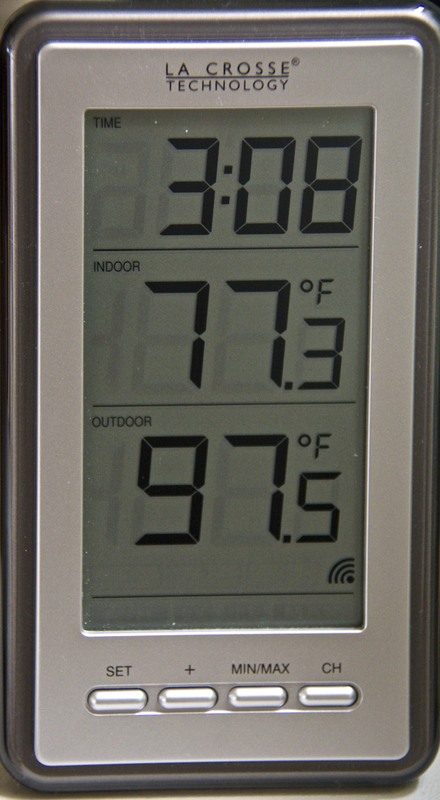 This is the temperature in the house and on our back deck as of a half hour ago. It is now up to 99.3. I HATE the heat! We have no air conditioning. My garden hates the heat too. It is only April 29. What the heck is this summer going to be like? My collard greens have wilted. My beautiful salmon-colored orchid cactus opened up one magnificent blossom yesterday, but it is all wilted today. The Santa Ana winds are howling outside. I will not be gardening today. 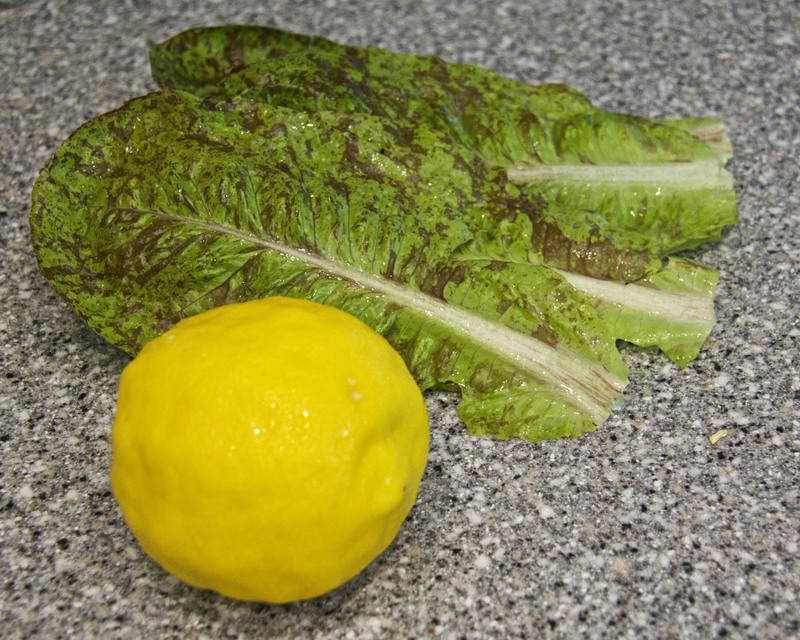 However, I did turn some of my lemon harvest into some ice-cold lemonade with mint in it. Yum. Here is our harvest from last week. Well, that is a record harvest. I don’t think I’ve ever had one this large, not even in August or September when the tomatoes turn ripe. My tiny little yard is doing itself proud this year. Now the challenge will be salvaging the rest of the peach harvest from the squirrels, night critters, heat, and wind, and then turning it into pies or frozen peaches before mold takes over. Why do food preservation needs always seem to fall on the hottest days? Even in April? Gimme a break. If you had a harvest, or to see what others are harvesting, visit Daphne’s Dandelions. For some reason, I have not been able to post comments there, or on any BlogSpot blog. Is anyone else having this issue? This is a WordPress blog. This entry was posted in Uncategorized and tagged citrus, Harvest Monday, peaches, Santa Ana winds, southern California. Bookmark the permalink. 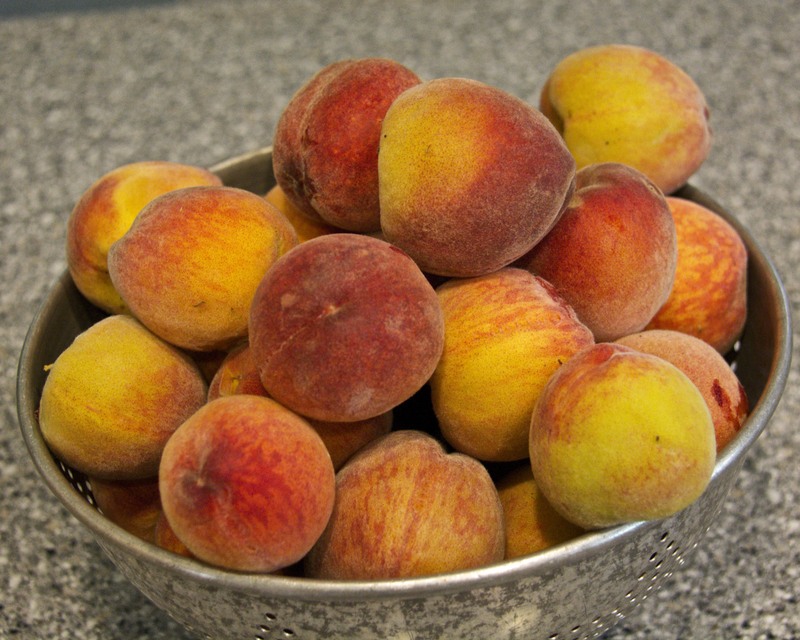 Oh those peaches make me drool, we need some heat here, it’s been cold and super windy in our neck of the woods. Those peaches look so delicious. And I hate the heat too. I do have air conditioning though. I leave it at 80F most of the time and use it mostly to take the humidity out of the air. Though occasionally we get some real heat too and need to actually cool things down. Congratulations on your record harvest! You are an inspiration! Thanks, Christy. My garden is so small that it is hard to believe that it could be inspirational. I too am drooling over your beautiful bowl of tree ripened peaches. 97.5, that sure is HOT. glad you had some ice-cold lemonade to cool off and hope your nighttime temp drop to a comfortable level.